The central shrine of a literary cult is at least as often its hero's home of adoption as his place of birth. To the Wordsworthian, Cockermouth has but a faint, remote interest in comparison with Grasmere and Rydal Mount. Edinburgh, for all its associations with the life and the genius of Scott, is not as Abbotsford, or as that beloved Border country in which his memory has struck its deepest roots. And so it is with Dickens. The accident of birth attaches his name but slightly to Landport in South-sea. 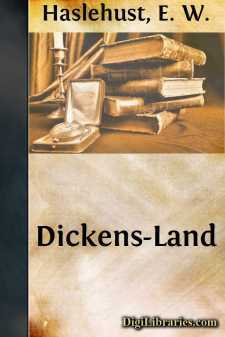 The Dickens pilgrim treads in the most palpable footsteps of "Boz" amongst the landmarks of a Victorian London, too rapidly disappearing, and through the "rich and varied landscape" on either side of the Medway, "covered with cornfields and pastures, with here and there a windmill or a distant church", which Dickens loved from boyhood, peopled with the creatures of his teeming fancy, and chose for his last and most-cherished habitation. What Abbotsford was to Scott, that, almost, to Dickens in his later years was Gadshill Place. From his study window in the "grave red-brick house" "on his little Kentish freehold"—a house which he had "added to and stuck bits upon in all manner of ways, so that it was as pleasantly irregular and as violently opposed to all architectural ideas as the most hopeful man could possibly desire"—he looked out, so he wrote to a friend, "on as pretty a view as you will find in a long day's English ride.... Cobham Park and Woods are behind the house; the distant Thames is in front; the Medway, with Rochester and its old castle and cathedral, on one side." On every side he could not fail to reach, in those brisk walks with which he sought, too strenuously, perhaps, health and relaxation, some object redolent of childish dreams or mature achievement, of intimate joys and sorrows, of those phantoms of his brain which to him then, as to hundreds of thousands of his readers since, were not less real than the men and women of everyday encounter. On those seven miles between Rochester and Maidstone, which he discovered to be one of the most beautiful walks in England, he might be tempted to strike off at Aylesford for a short stroll to such a pleasant old Elizabethan mansion as Cobtree Hall, the very type, it may be, of Manor Farm, Dingley Dell, or for a longer tramp to Town Malling, from which he may well have borrowed many strokes for the picture of Muggleton, that town of sturdy Kentish cricket. Sometimes he would walk across the marshes to Gravesend, and returning through the village of Chalk, would pause for a retrospective glance at the house where his honeymoon was spent and a good part of Pickwick planned. In the latter end of the year, when he could take a short cut through the stubble fields from Higham to the marshes lying further down the Thames, he would often visit the desolate churchyard where little Pip was so terribly frightened by the convict. Or, descending the long slope from Gadshill to Strood, and crossing Rochester Bridge—over the balustrades of which Mr. Pickwick leaned in agreeable reverie when he was accosted by Dismal Jemmy—the author of Great Expectations and Edwin Drood would pass from Rochester High Street—where Mr. Pumblechook's seed shop looks across the way at Miss Twinkleton's establishment—into the Vines, to compare once more the impression on his unerring "inward eye" with the actual features of that Restoration House which, under another name, he assigned to Miss Havisham, and so round by Fort Pitt to the Chatham lines. And there—who can doubt?—if he seemed to hear the melancholy wind that whistled through the deserted fields as Mr. Winkle took his reluctant stand, a wretched and desperate duellist, his thoughts would also stray to the busy dockyard town and "a blessed little room" in a plain-looking plaster-fronted house from which dated all his early readings and imaginings.